It’s Thursday evening in Dhaka, the capital of Bangladesh. I am late for an appointment to see my friend Shimanto (lit. boundary [Sanskrit]). On the street I shout ‘ei mama jaben?’ (Hey uncle, will you go? 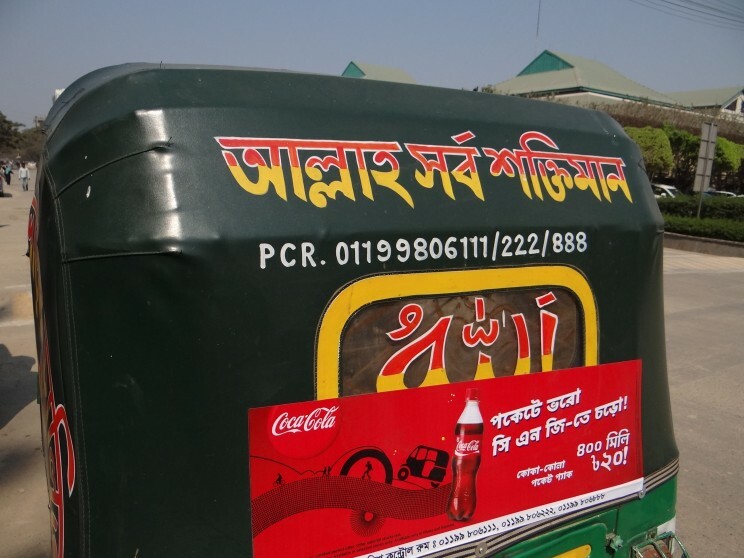 [Bangla]) to catch an auto-rickshaw (auto [English] man-powered-wheeler [Japanese]). After striking the deal, I sit inside the three-wheeler. As the young driver speeds up almost hitting passers-by and curses ‘jyam khub kharap!’ (Traffic jam [English] is very bad! [Persian]), I recollect the writing at the back of the car: ‘allāḥ sarvaśaktimān’ (God [Arabic] almighty [Sanskrit]). After a while, we safely arrive the destination. As we part, I say ‘dhanyavāda’ (Thank you [Sanskrit]). dekha hobe! (See you! [Bangla]) and the driver returns ‘xoda ḥafīẓ!’ (God [Persian] be with you! [Arabic]). Everyday conversation in Bangla is thus rich with linguistic diversity. Bangla is the national language of Bangladesh, which Bangladeshis are very proud of. However, behind the current prestige of Bangla lies a tragic memory of Bangladeshis’ struggle for cultural, linguistic, and ethnic freedom. Bangladeshis symbolically commemorate that struggle every year on February 21st, calling the day Shoheed Divosh (Martyrs’ Day) or more commonly, Ekushey (Twenty-first). Ekushey became the cultural symbol of Bangladesh because several sacrificed their lives and hundreds were injured during a march on February 21, 1952, in their effort to promote Bangla as a national language of Pakistan. As a result of the independence movement that ended the British colonial rule, Dominion of India (current Republic of India) and Dominion of Pakistan (later Islamic Republic of Pakistan) were created in 1947. Pakistan was formed under the leadership of Muhammad Ali Jinnah who led the Muslim League. The nation then consisted of East Pakistan (which later became Bangladesh) and West Pakistan. They were two regionally, ethnically, and linguistically distinct regions. Nevertheless, since the majority of people in these two regions were Muslims the leaders of the Muslim League hoped that their shared religious identity was strong enough to tie them together. “An auto rickshaw.” Photo courtesy of Kiyokazu Okita. However, maintaining this hope became increasingly challenging as people in East Pakistan quickly realized their economic and cultural differences with West Pakistan. In this context, the status of Bangla in Pakistan became the most explosive political issue. Despite the repeated demand from East Pakistan that Bangla be made one of the state languages alongside Urdu, the most prominent language in West Pakistan, leaders in West Pakistan never acknowledged the demand. In 1948, Ali Jinnah visited East Pakistan and publically announced that only Urdu can be the state language, arguing that among many languages spoken in Pakistan, Urdu best represented Islamic culture and tradition. In the nineteenth century, Urdu became the symbol of Islamic language in South Asia due to its use of Arabic letters and its shared vocabulary with Arabic and Persian. Moreover, Bangla was typically associated with Hindu culture due to its connection with Sanskrit. In January 1952, the Muslim League finally made Urdu the official state language of entire Pakistan. Political leaders, the representative of cultural organizations, and students in East Pakistan immediately expressed their opposition, leading to a demonstration on February 21st. In the demonstration, several people died and many were injured as they clashed with the police. In the following years, Shaheed Minar (Martyrs’ Column) was erected and the celebrated song, Amar Bhaiyer Rakte Raṅgano (Colored in the blood of my brother), was composed. The collective memory of this tragic event fostered the development of the regional identity distinct from that of West Pakistan, which eventually led to the independence of East Pakistan as People’s Republic of Bangladesh in 1971. The language of Bangla thus became a symbol of Bangladeshis’ cultural, regional and ethnic identity. After independence, the memory associated with Ekushey increased. Nowadays, Bangladesh dedicates the entire month of February to celebrate the Bangla language. A large book fair is organized in Dhaka and various cultural performances are conducted throughout the country. The significance of Ekushey further became international when, in 1999, UNESCO declared February 21st as International Mother Language Day in order to celebrate language diversity worldwide. It is certainly important to learn one’s mother tongue because language is the vehicle of culture and tradition. Thus older generations’ complaints about young generation’s Hinglish and Banglish is well justified. That said, since language and nationalism are closely related, we should be careful that emphasis on mother tongue not lead to a narrow-minded linguistic nationalism either. Unfortunately, however, this is what happened in post-independent Bangladesh. Sheikh Mujibur Rahman, the first Prime Minister of Bangladesh, sought to build the new nation on the principles of nationalism, secularism, democracy, and socialism. In his effort to unite the country, he promoted Bangla as the national language of Bangladesh. However, while Bangla is the language spoken by the majority of people in Bangladesh, there are minority communities such as Manipuris, Chakmas, and Santals whose mother tongues are not Bangla. Nevertheless, Mujibur asked them to embrace Bangla, rejecting their right to maintain their mother tongues. This is sad as it undermines the very principle of Ekushey, through which Bangladesh claimed its independence from Pakistan. When those who are dominant – due to their strength or numbers – force the other to adopt their language, as West Pakistan did to East Pakistan, or Mujibur to minorities in Bangladesh, it becomes a form of violence. However, pride in mother tongue does not have to lead to narrow-minded sense of superiority in one’s ethnicity or nation. As in the case of Bangla, we can observe in any language the influence from other languages. On International Mother Language Day, perhaps we can reflect on the linguistic diversity within our mother tongue that reflects a rich history of interaction. Image Credit: “Shaheed Minar on Ekushey, 21st February.” Photo courtesy of Kiyokazu Okita. Kiyokazu Okita is an Assistant Professor at The Hakubi Center for Advanced Research and Department of Indological Studies, Kyoto University. 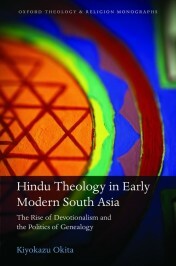 He is the author of Hindu Theology in Early Modern South Asia. I hope that Esperanto was not forgotten today. Esperanto is a planned language which belongs to no one country or group of states. Using it brings speakers of different mother tongues together without having to resort to English or a strong regional language. How do we translate ‘International Mother Language Day’ in other languages? It is interesting that someone mentioned Esperanto here, since Sanskrit was similarly an artificially refined lingua franca. It enabled for centuries learned pandits who spoke different Indian dialects as their mother tongues to communicate and share an immense body of literature larger than those of other cultures combined. The modern-day situation of Hindi is different as Okita pointed out. English and other national languages (e.g. Putonghua) threaten other minority languages into extinction. My experience in Esperanto is very positive and critics of artificial languages most often have no experience in them. As a native speaker as a minority language (Cantonese), I have to struggle with others’ languages all my life. I became fluent in Esperanto a year or so after I learned it for a few weeks and I have been speaking it for almost twenty years since. It is not surprising that most of my Esperanto friends from around the world are also native speakers of minority languages. “Internacia gepatrolingva tago” what includes also the father. In Telugu, ‘International Mother Language Day’ translates to ‘Antarjateeya Maatru Bhashaa Dinotsavam’.